When Michelle Cox begins working with a student, she often hears the same question. 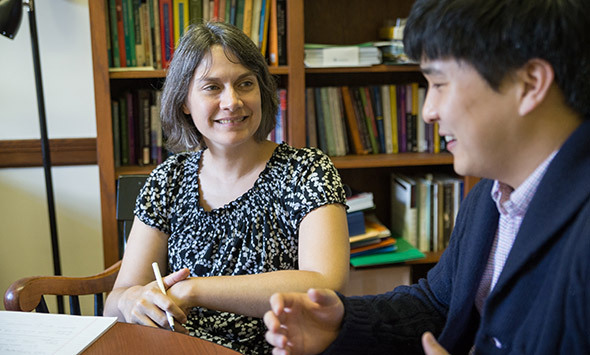 Cox, a multilingual specialist with Dartmouth’s Institute for Writing and Rhetoric, teaches writing to students who use English as an additional language. She works one-on-one with graduate students across disciplines to help improve their writing. Since writing plays an important role in a student’s ability to receive grants, pass courses, complete degree programs, publish in journals, and get a job, Cox’s work is vital. While writing for graduate school is challenging for all students, it can be even more challenging for international multilingual students. Some of the challenges are due to reader expectations. “We often expect people from other countries to speak with an accent,” says Cox, “but we don’t expect them to write with one.” She described “written accent” as marked by such things as missing articles, missing verb endings, and sentence structures influenced by the student’s first language. Further, some countries have strong oral traditions and students in secondary school are often tested orally instead of through written work, says Cox. This can make the amount of writing required at Dartmouth an adjustment for these students. But that is far from their only adjustment. “It’s fascinating to see the extent to which culture, identity, and language influence writing,” says Cox. For example, she works with an international graduate student who asked for help in crafting a cover letter. “The student was writing these elaborate, beautiful sentences,” Cox says, “But there are conventions for cover letters—this is writing with high stakes. For the student, it wasn’t a language issue; it was a cultural and rhetorical issue.” Cox noted that the student’s writing style could be related to cultural preferences for writing or to a lack of familiarity with the rhetorical context and conventions of American cover letters. Cox explained that when she works with a student’s writing, she tries to figure out how the student is making decisions about the writing—whether the decisions are based on how students were taught to write in their home country, their experiences writing in other genres, or how they were taught English. Understanding these decisions helps Cox figure out how to move the students forward as writers. Cox, who also teaches a writing course for international multilingual undergraduates, came to Dartmouth in the fall of 2012. In addition to teaching and tutoring, Cox has spent time researching other ways to support multilingual students. Recently, she surveyed Dartmouth professors, international graduate students, and international post-docs about what would be the most helpful writing support for the Institute to provide. She says it can be frustrating for both students and faculty when there is a language issue, and she hopes to assist both sides. “These students are working incredibly hard, and yet they often feel like their work is subpar,” says Cox. Cox is glad Dartmouth is tackling this problem, as some schools offer very limited assistance to multilingual students, particularly at the graduate level. Kanghoon Jung, a graduate student from South Korea, noted that Cox’s tutoring has been invaluable. It is students like Jung who make Cox’s work especially rewarding, she says.